Whether you dream all day or fly kites on the beach, you'll treasure the memories of time well spent on this newly renovated jewel on Oregon's central coast. 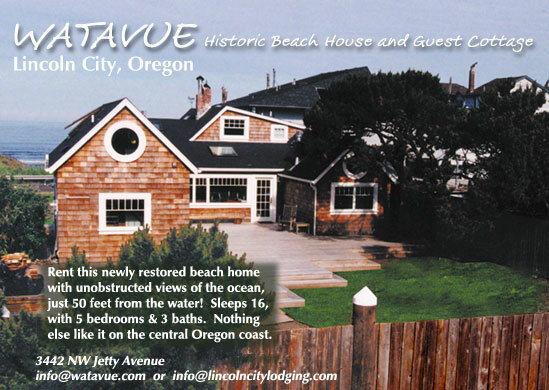 Stay at WATAVUE and/or WECOMA Creekside, the central Oregon coast's premiere vacation rentals in Lincoln City. Situated on Wecoma Beach, these historic homes and spacious grounds are ideally equipped for family reunions and conferences. Common misspellings of and associations for WATAVUE: Whataview, What A View, wataview, Lincolncityvacation, Lincoln City Vacation, Lincolncitylodging, Lincoln City Lodging. Unique location for: offsite retreats, conferences, family gatherings, reunions.